Nothing makes a room feel more clean than vacuuming. The typical family of four will vacuum their living room an average of 104 times a year. While these tips won't cut down on the number of times you have to vacuum, they will make it more efficient. Prepare the room. 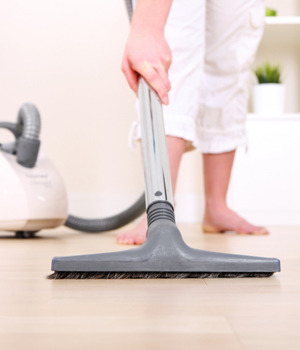 One of the easiest ways to save time when vacuuming is having the room ready. Having loose items picked up off the floor, having the furniture pulled away from the walls and having small rugs picked up all can make running the vacuum easier and reduce starts and stops. Perform regular maintenance. A majority of vacuums get tossed to the curb when the belt breaks or wears out. If your vacuum loses suction, it's likely because the rubber belt got stretched, which impedes the brush. For a few dollars and the help of a repair shop, you can often bring your vacuum back to life again for less than the cost of a new vacuum. Invest in a couple options. Having a small hand vacuum with a beater bar can be extremely helpful when vacuuming upholstery and carpeted stairs. Their hand-held, maneuverable nature can save you countless minutes and help you avoid the hassle of using a larger vacuum. You should also consider purchasing a small vacuum to keep in a bathroom for quick floor cleaning.